County Clare (Irish: ) is a county in Ireland. It is located in the Mid-West Region and is also part of the province of Munster. Clare County Council is the local authority for the county. The population of the county is 117,196 according to the 2011 census. Clare is north-west of the River Shannon covering a total area of 3,400 square kilometres (1,300 sq mi). 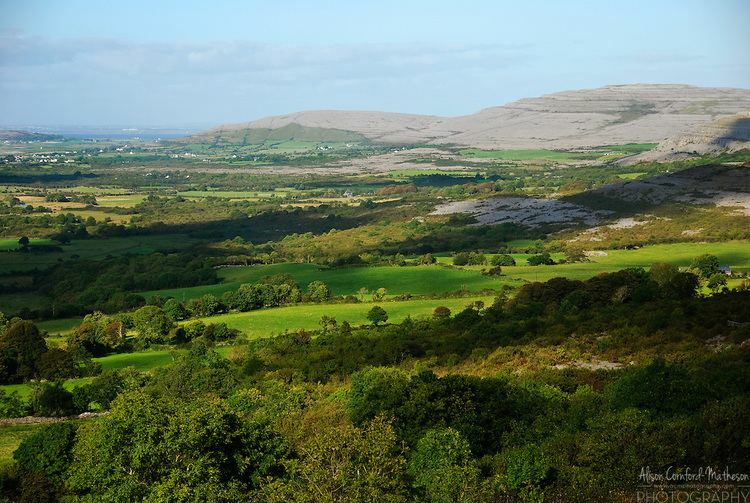 Clare is the 7th largest of Irelands 32 traditional counties in area and the 19th largest in terms of population. It is bordered by two counties in Munster and one county in Connacht: County Limerick to the south, County Tipperary to the east and County Galway to the north. Clares nickname is the Banner County. 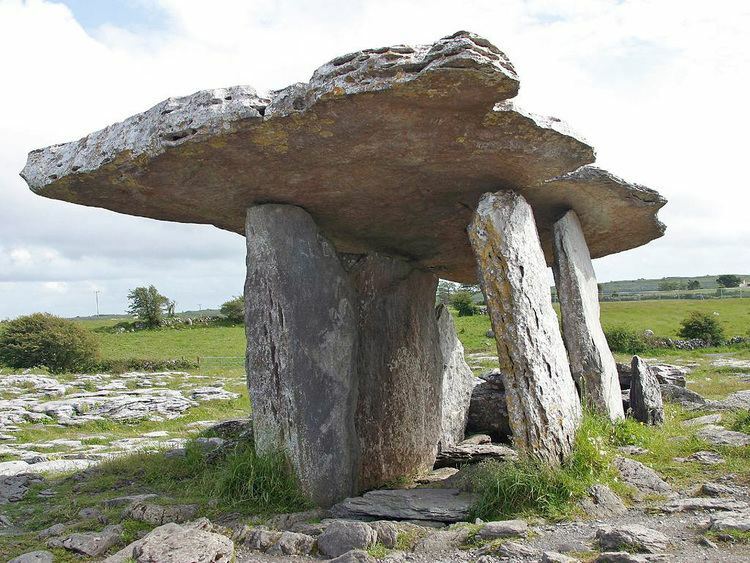 There was a Neolithic civilisation in the Clare area — the name of the peoples is unknown, but the Prehistoric peoples left evidence behind in the form of ancient dolmen; single-chamber megalithic tombs, usually consisting of three or more upright stones. Clare is one of the richest places for these tombs in Ireland, the most noted is in The Burren area, it is known as Poulnabrone dolmen which translates as the hole of sorrows. The remains of the people inside the tomb have been excavated and dated to 3800 BC. Ptolemy created a map of Ireland in his Geographia with information dating from 100 AD, it is the oldest written account of the island with geographical features. 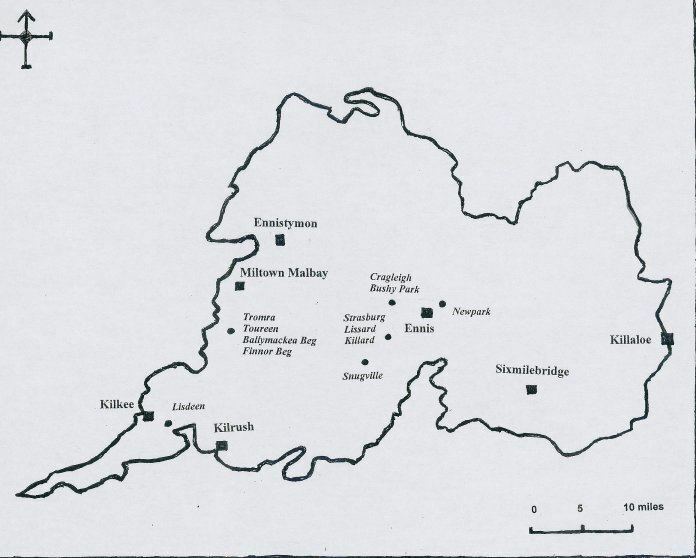 Within his map Ptolemy names the Gaelic tribes inhabiting it and the areas in which they resided; in the area of Clare he identified a tribe known as the Gangani. Historians have found the tribes on the west of Ireland hardest to identify with known peoples, however Camden and OConor speculated a possible connection between the Gangani and the Concani, one of the eleven tribes in the confederacy of the Cantabri in the northern part of the Iberian Peninsula. During the Early Middle Ages the area was part of the Kingdom of Connacht ruled by the Ui Fiachrach Aidhne, until it was annexed to the Kingdom of Munster to be settled by the Dalcassians in the mid-10th century. It was renamed Thomond, meaning North Munster and spawned Brian Boru during this period, perhaps the most noted High King of Ireland. From 1118 onwards the Kingdom of Thomond was in place as its own petty kingdom, ruled by the OBrien Clan. After the Norman invasion of Ireland, Thomas de Clare established a short-lived Norman lordship of Thomond, extinguished at the Battle of Dysert ODea in 1318 during Edward Bruces invasion. The county name Clare probably comes not from the de Clare family, but from the settlement of Clare (now Clarecastle) whose Irish name ["plank bridge"] refers to a crossing over the River Fergus. In 1543, during the Tudor conquest of Ireland, Murrough OBrien by surrender and regrant to Henry VIII became Earl of Thomond within Henrys Kingdom of Ireland. Henry Sidney as Lord Deputy of Ireland responded the Desmond Rebellion by creating the presidency of Connaught in 1569 and presidency of Munster in 1570. He transferred Thomond from Munster to Connaught, which he shired, Thomond becoming County Clare. About 1600 Clare was removed from the presidency of Connaught and made a presidency in its own right under the Earl of Thomond. When Henry OBrien, 5th Earl of Thomond died in 1639, Lord Deputy Thomas Wentworth, 1st Earl of Strafford decreed Clare should return to the presidency of Munster, but the Wars of the Three Kingdoms delayed this until the Restoration. Clares nickname is the Banner County, which may refer to a former local tradition of carrying banners at political meetings and public occasions. It was Daniel OConnells victory in an 1828 by-election for County Clare that led to the Roman Catholic Relief Act 1829, a key milestone in "Catholic emancipation". Scattery Island, in the Mouth of the Shannon off the Clare coast, was transferred to Limerick Corporation and the county of the city of Limerick after the dissolution of the monasteries, and assigned to County Clare after the Municipal Corporations (Ireland) Act 1840. Under the Local Government (Ireland) Act 1898, part of the judicial county of Galway (Drummaan, Inishcaltra North and Mountshannon electoral divisions) was transferred to county Clare. This area contains the village of Mountshannon on the north-western shore of Lough Derg.